Yhi the wombat may still be only a baby, but she's got an important job to do. Admittedly though, it's something nobody asked for. Rather, she assigned herself. 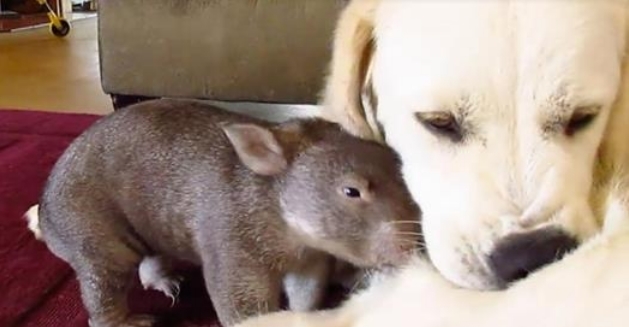 In a sweet new video from the Sleepy Burrows Wombat Sanctuary in Australia, we see Yhi eagerly lending her tiny choppers to help a dog named Stella tend to an itch. Stella, meanwhile, appears more than capable of completing the task without assistance. Still, she has the utmost patience for the wombat apprentice, and even gives Yhi kisses as a reward for her effort. This little arrangement between Stella and Yhi is about much more than just being cute. Dogs at the sanctuary play an important role for the rescued wombats, keeping them safe and cared for just like the human members of the team. Sleepy Burrows Wombat Sanctuary work includes relocating wombats, assisting councils and farmers, educating children and people in general about wombats. Encouraging co-existence in our ever changing world which is dominating their habitat in a very serious way. Wombat joey Yhi assisting Stella with her grooming .....sort of (watch when Yhi gets her tongue:)). Remember, Stella guards the wombats, that is what she is bred to do so she is with them from a very young age, protecting and looking after them. Responses to "Wombat Helps Dog Scratch An Itch, Gets Rewarded With Kisses"
I have never seen a wombat. This is an adorable unusual animal relationship.